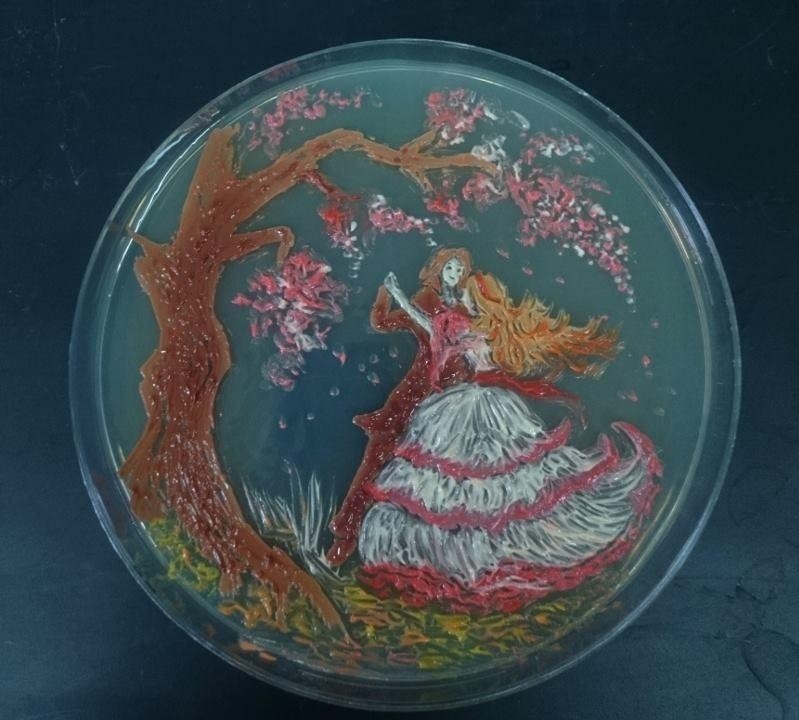 The American Society For Microbiology (ASM) holds an annual art contest, but it's no ordinary art they look for. The ASM looks for agar art, which results in, essentially, creating a painting with bacteria. 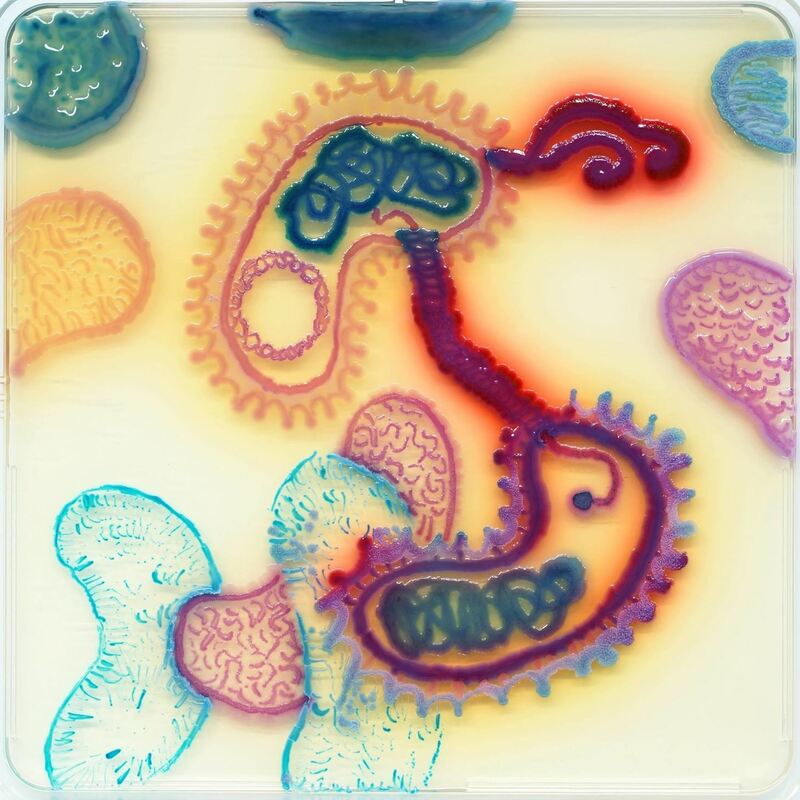 It's fascinating; using an agar plate which feeds the bacteria as they grow, artists inoculate the plates with bacteria that are naturally colorful or those with fluorescent genes of different colors to create vivid art pieces. Inoculating the plate is like drawing with invisible ink since the bacteria are microscopic. Different bacteria grow at different rates and different temperatures, so the process can be quite long and involved and take some extended periods of waiting, but the end results are breathtaking. The competition was started by Chaseedaw Giles of the ASM, as well as their Communications Fellow at the time, Janet Rowe. This is the third year in a row for the contest, which this year received 265 submissions from 36 countries. All of the entries are shared on ASM's Facebook page and include details shared by the original creator, some of which are shared below with their images. The first example is this cool glowing tiger, created by the ASM team as an example. 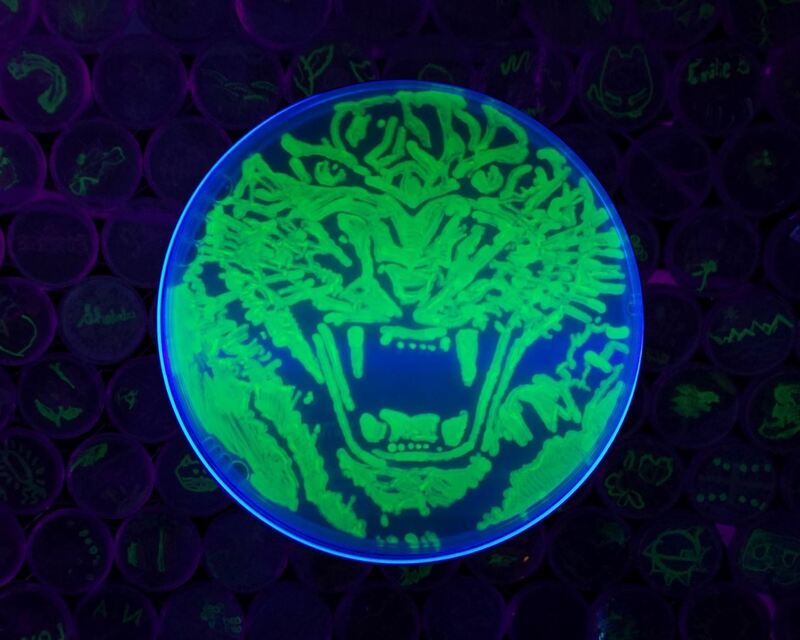 Our demo tiger gets its 'stripes,' so to speak, by expressing green fluorescent protein (GFP) that glows under black light. Using a palette of engineered GFP derivatives, participants created over 500 unique bacterial art pieces (a portion is shown in the background) that were recently displayed as a living art mosaic. By painting with live, genetically modified bacteria, participants of all ages learn about the safety, utility and fun of genetic engineering. By engaging the public both as painters and viewers, we've been able to create an immersive experience that captures arts, science, and the imagination. The Earth depicted on the plate below is dangerously infected with antibiotic-resistant MRSA bacteria. 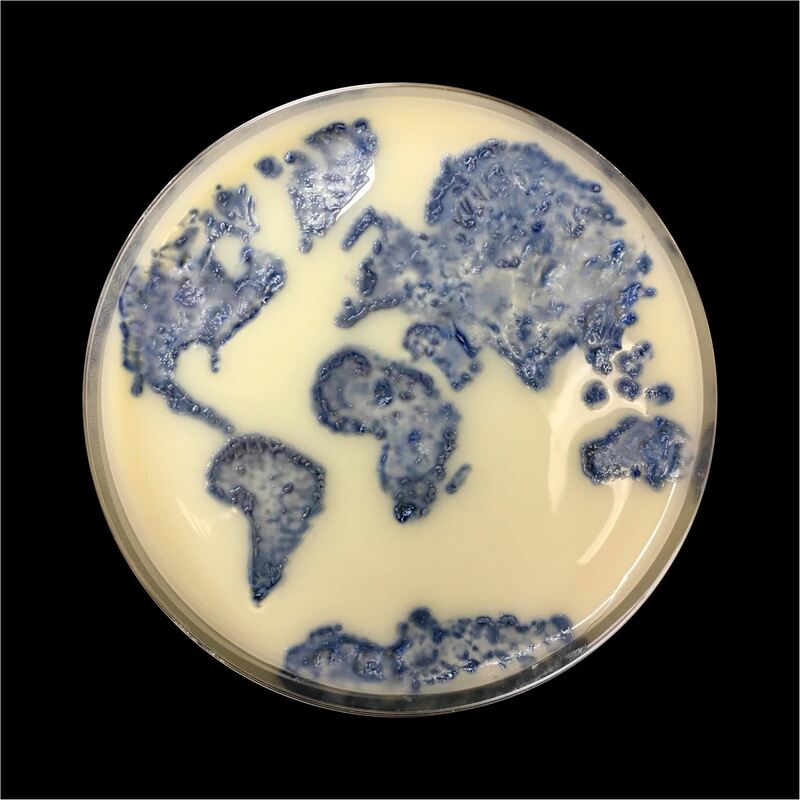 I used Spectra MRSA chromogenic media (opaque milky color) to illustrate a map of the Earth using methicillin-resistant Staphylococcus aureus (denim blue). I used an inoculation loop to make stab marks along the border of continents and a sterile swab to fill the outlines. I made a few minor rearrangements to the continental layout in order to fit the globe on a single plate. According to my version of the Earth, international flights just got a lot shorter (and cheaper). Great news if you're looking for cheap airfare, but shorter international flights would be bad news for the spread of resistant organisms like MRSA. The colorful living painting below mixes bacteria and yeast for intersting undulating structures. It shows how DNA is transferred from one bacteria to another, sharing and spreading dangerous antibiotic resistance genes. All bacteria used to compose this art are resistant to antibiotics. Most belong to the family Enterobacteriaceae, which are part of the top 12 most dangerous superbugs listed by the World Health Organization in 2017. A yeast was also included to obtain the wrinkled aspect seen around the recipient bacterium. The red halo surrounding the pilus is due to a natural pigment released by a bacterium called Serratia marcescens. Specific compounds have been added to the agar to generate the other colors. Those compounds are uncolored, but once they are digested by the microbes, they become either pink or blue. 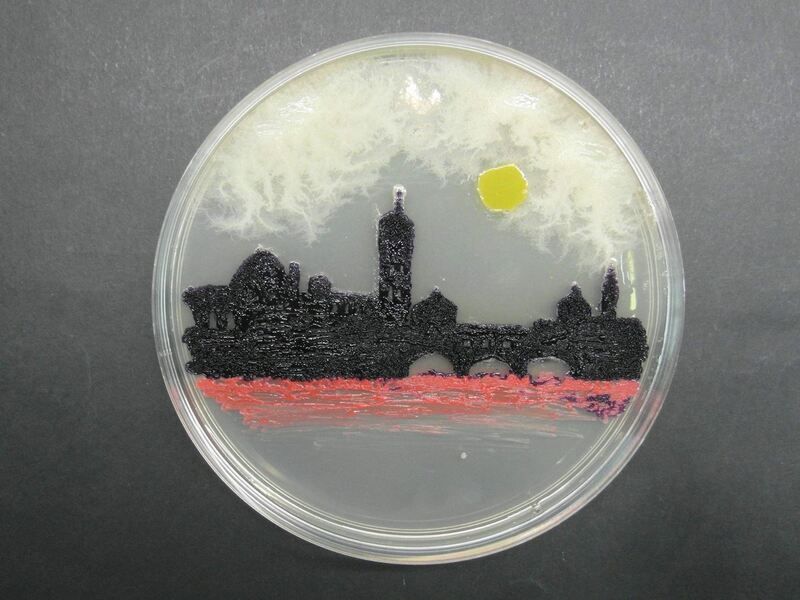 This artist wrote a poem along with their bacterial art. Both partaking in the galactic race. They hope to enjoy their lunch, and soon. These space voyagers hope to travel far. The gravity they shoulder feels astronomical. 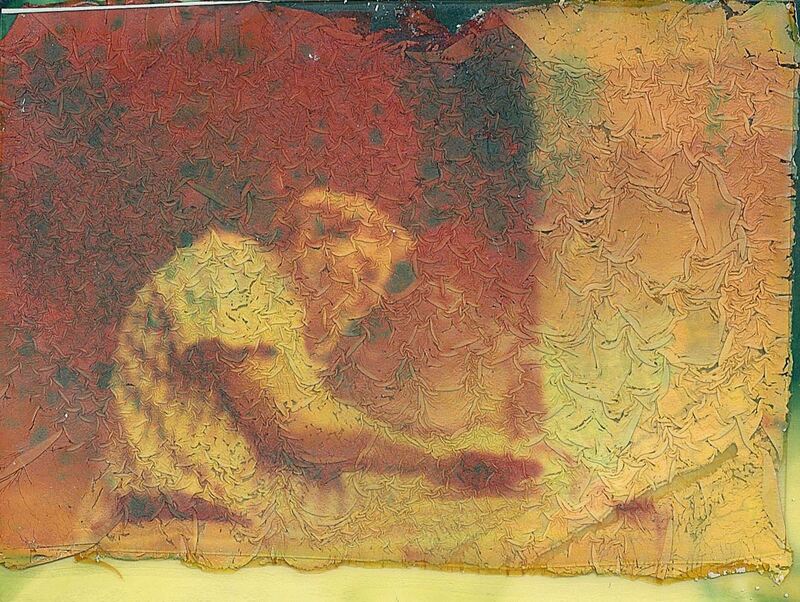 Taking a different approach, this artist let the bacteria destroy an image, instead of creating one. Polaroid film, opened at the back site was placed on the agar plate and incubated at room temperature for 2x 24 hours. The bacteria partially broke down the film. The bacteria growing in this Taj Mahal turned the plate yellow. After growing for 24 hours at 37 °C, a healthy growth of Bacillus sp. showed fermentation of mannitol with high salt tolerant ability, turning the surrounding medium yellow from red due to acid production. 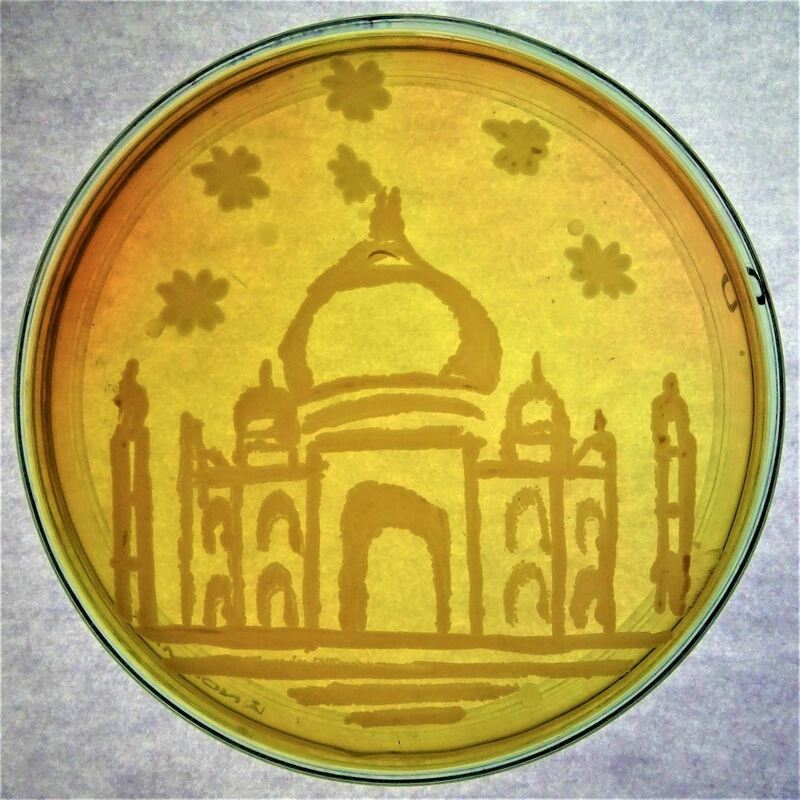 Carefully drawn Taj Mahal from Bacillus sp. over the Manila sky, sprinkled with stars, tells an Eastern tale of romance and longing. The red glow of this Golden Gate harkens back to a historical bioterrorism experiment, known as, one of the largest human experiments in history, which released bacteria into the San Francisco fog. 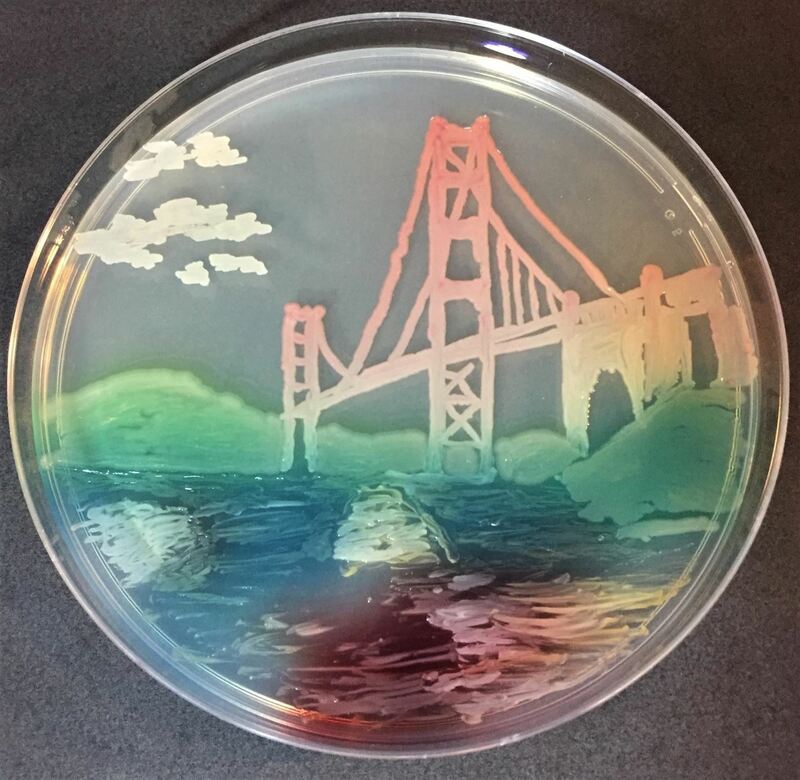 Golden Gate Bridge was painted with Serratia marcescens, which produces red pigment prodigiosin. This organism is also associated with a historical event that happened in San Francisco during 1950. Due to its red pigmentation, which could be easily tracked, it was used in the experiment where military sprayed a cloud of Serratia marcescens — believed at the time to be harmless — over San Francisco. They wanted to investigate how the city's iconic fog might help with the spread of bacterial warfare. A week after the spraying, 11 patients were admitted to Stanford Hospital with severe urinary tract infections. These cases led to the first recorded outbreak of Serratia marcescens in the history of microbiology. 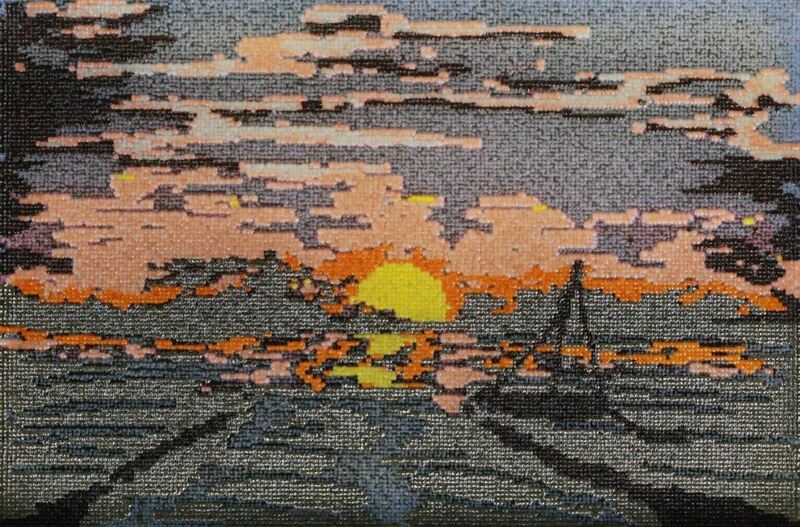 In the image below, of a sunset in Montauk, New York, each individual dot is a colony of bacteria. 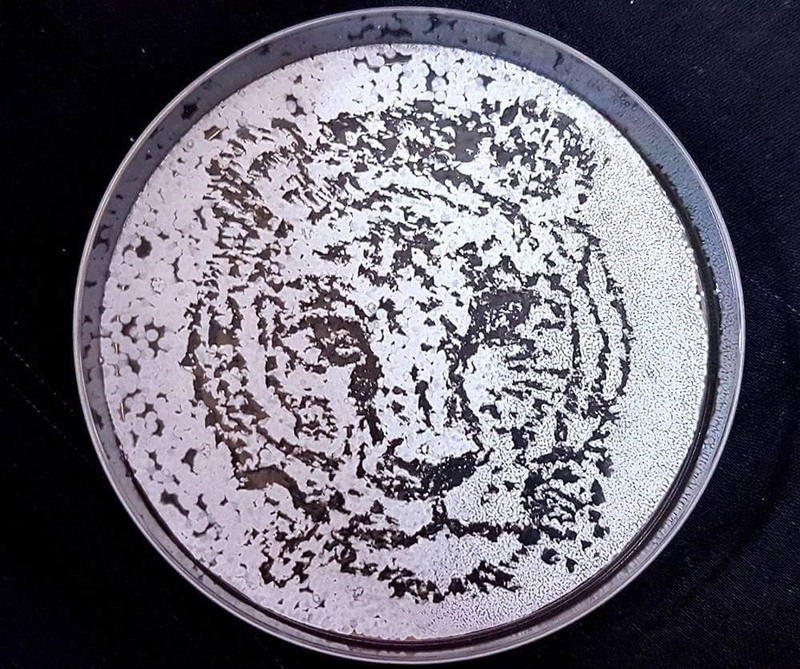 [The artist] created it by 'printing' nanodroplets of media containing baker's yeast with pigment-encoding plasmids (Saccharomyces cerevisiae) onto a large agar plate (12cm by 8cm). Each dot is a separate yeast colony. The image is printed pixel by pixel, generating a composite image which we term 'biopointillism.' The colonies grow to create the a and the pigments slowly develop over days or weeks. The different colored yeast strains were constructed by genetically engineering the yeast to produce pigments naturally made by bacteria, fungi, coral and anemones. This method allows for up to 24,576 biopixels per image, yielding intricate designs and details. The artist who created the image below, called "Dancing Microbes" used bacteria from their own skin and the air. The white color, which is on the face and the dress of the girl and the boy, is Staphylococcus epidermidis. It is a part of the normal human flora, typically, the skin flora, I isolated them from my own skin. The pink color of the girl's dress and the tree flowers is made of Rhodotorula mucilaginosa, it's a common environmental inhabitant. It can be isolated from soil, milk, and air samples. I [collected] it from air. Rhodotorula can cause disease in immunosuppressed people. the yellow color of the lady's hair is Micrococcus luteus, it is urease and catalase positive. An obligate aerobic microbe, M. luteus is found in soil, water, air and as part of the normal flora of the mammalian skin. The green is Xanthomonas axonopodis. The fluffy bacteria featured in "Bacterial endophytes celebrating the beauty of Florence" naturally grow on the inside of plants, where they protect against invaders. Endophytes are bacteria inhabiting the internal tissue of a plant. Endophytic bacteria play a key role by promoting plant growth, defending the host against pathogenic microorganisms, and representing a potential reservoir of important bioactive molecules. The artwork has been realized by using endophytic bacteria isolated from Phragmites australis, an interesting botanical species used for detoxification of pollutants through phytoremediation in wastewater treatment plants. 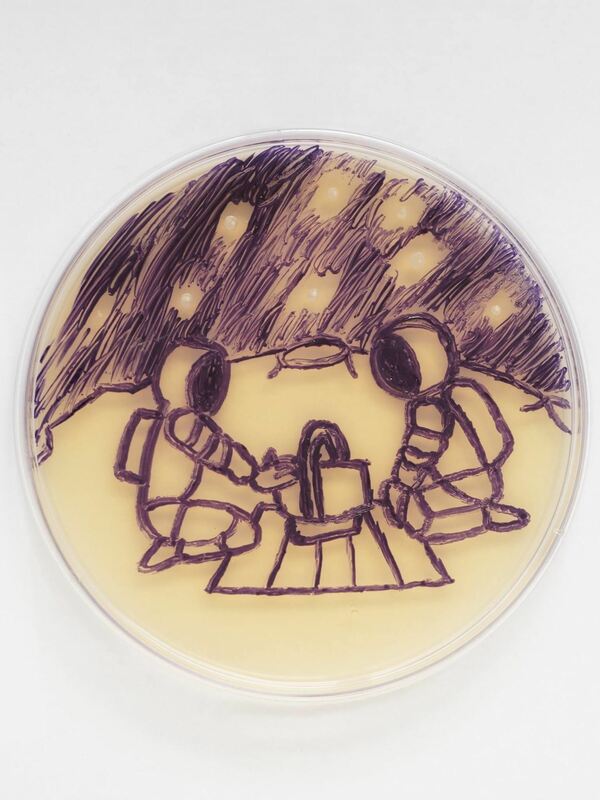 The bacterial art below, "Negative Space Art with Gram-Positive Thermoactinomyces," uses a bacteria specially adapted to growing in extremely hot conditions, called an extremophile. This negative space art was made by using a Thermoactinomyces sp. strain isolated from geothermal spring located near Akhurian River (Armenia). The strain used is an extremophile and grows optimally in environments with high temperatures (>55°C) and forms white colored aerial mycelium.